The pyramids with the jackals of reverse color on each side represent the experience of the spirit. 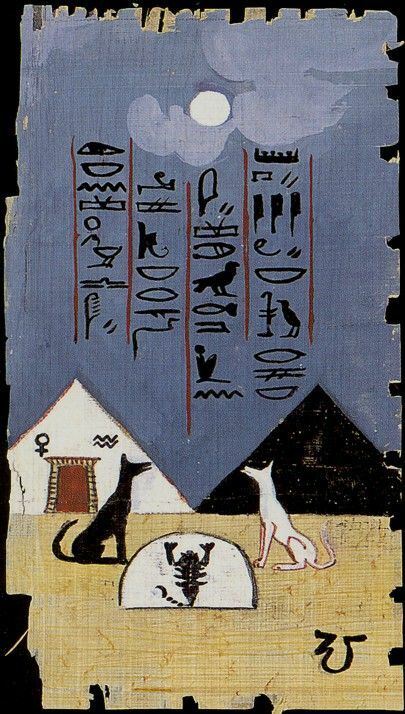 The white pyramid is STO polarization with a black jackal guarding it. The jackal is black because seemingly negative experiences help us to develop positive STO biases whereas the black pyramid with the white jackal represents STS polarization with seemingly positive experiences producing negative biases. This is quite appropriate under the Moon for the Moon may reveal “truth in shadows” or falsity. That’s all I have for now regarding these two. Plenum has already spoken on these two, but the symbols finally clicked for me so I thought I’d share my understanding. Ra said that we should attempt our own understandings so that’s what I am trying to do now. I’m looking at the three Potentiators right now: II, IX, XVI. The Hermit- the figure is of an elderly man. His slightly hunched back denotes old age. Old age denotes Wisdom. He holds the lamp/flame in his left hand indicating concious Will. The flame represents force, energy, will. The Potentiator of Body is then that which wisely regulates the activity of the body. Furthermore, two serpents are before his feet. Another interesting aspect of this image: the portal of the pyramid/tower. In it are inscribed hieroglyphs. The topmost hieroglyph is of two angels with wings outstretched with the egg of akasha (spirit) in the midst. (03-22-2012, 12:55 PM)Bring4th_Plenum Wrote: if YOU have had an insight into ONE of the Archetypes, but it isn't sizable enough to start a new thread, or would derail an existing one, then please Share it here, in this thread. think of this as a place of collective wisdom, or group brainstorming on the archetypes. And when the seed has sprouted, someone can then start a new thread with that germinated idea. personally, I have been getting a lot of Clarifications in dreams recently. My one last night had to do with the Inner Critic and the LOVERS Card. Let us just say that eternal true lovers (yin/yang, male/female polarity) don't criticize each other, but accept each others' being and essence unconditionally. This is more than 'unconditional love'. It is about a total embracing of the other, with full knowledge of that other. I’m studying the three Significators right now, specifically the Hanged Man (Significator of Body). I noticed something very interesting with the Egyptian Church of Light version: his body forms an upside down Crux Ansata. What’s significant is that his legs are crossed in a 90 degree angle which denotes transformation. Remember that the Significator is both actor and acted upon. He consciously chooses the sacrifice (of what? I’m trying to figure out.) which is to affect transformation of body, denoted by the cross of his legs surmounting the circle shape of his upper body and arms. 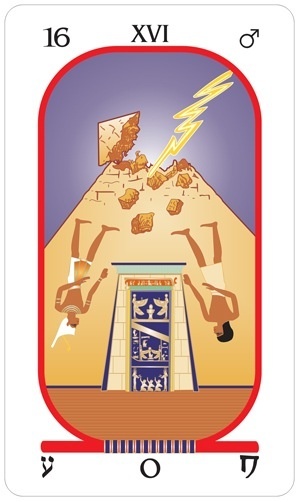 This takes place within the material illusion represented by the rectangular Tau structure which the Hanged Man hangs. It is entwined with grapes. I have some theories: the grapes represent that the material illusion is fertile ground for the Significator of Body. It’s what allows the Signifcator to exercise his will and to transform thereby. It may represent that the sacrifice is a fruitful endeavor. He sacrifices materiality (his dropping of the coins) for the fruitful concious Transformation of Body affected only by being within the material illusion. Keyword: self-sacrifice, this stands out in my mind. Possibly but I can’t say for sure. Next is the Transformation (Death) and then the Great Way (The Alchemist/Temperance). 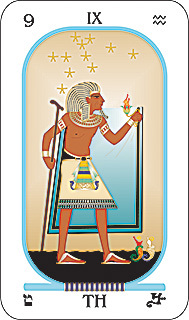 What’s so fascinating to me about the Egyptian images is that the Alchemist has the green skin of Osiris. Meaning that he is the sacrificed god who resurrects by death. This is a spiritual analogy of initiation. 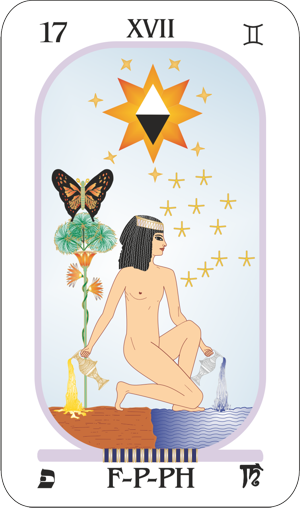 the Adept plays the role of Osiris in dying and being reborn again. So this self sacrifice is a neccessary step towards the Great Way of Temperance/Alchemist. Does anyone know what the symbol coming from the center of the sun means? The soul of the Logos coming down to us as love ? (04-15-2019, 02:23 PM)flofrog Wrote: The soul of the Logos coming down to us as love ? From that, and Ra’s comments (Signifcator of Spirit either radiates or absorbs the love and light of the Logos), the Significator is receptive/ open to the influence of the spirit. ??? I’m not sure though. I feel that the male and female are both aspects of the self. I can’t help but think in Qabalstic terms right now, but this makes sense if we consider that the male is the Ruach (rational concious intellect) and the female the Neshamah (Higher unconcious). They’re in harmony which allows for the radiation or absorbtion of Love/Light. Ruach is also an aspect of Spirit, the self awareness. I am going to contemplate this further in meditation. I feel like I’m on the brink of grasping something but can’t reach it.